"She's the world's strongest psychic and she just woke up." Daisy, the world's first and only confirmed psychic with a classification of zero on the descending nine to one Laoton scale, has been comatose in an underground government research facility for years, but today that's all going to change. The Comatose Girl has not been tagged yet. Help others find The Comatose Girl by tagging it! 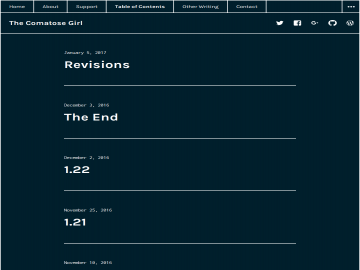 The Comatose Girl has not been reviewed yet. The Comatose Girl has not been recommended yet.